"Japanese Empresses" redirects here. For the 1891 ocean liner, see RMS Empress of Japan (1891). For the 1930 ocean liner, see RMS Empress of Japan (1930). Empress of Japan or Japanese Empress means a female imperial ruler (女性天皇, josei tennō). The term can also mean an empress consort (皇后, kōgō). 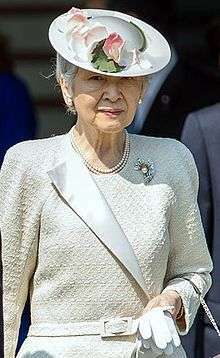 The current empress consort is Empress Michiko. There were eight female imperial reigns (six female emperors including two who reigned twice) in Japan's early history between 593 and 770, and two more in the early modern period (Edo era). Although there were eight reigning empresses, their successors were most often selected from amongst the males of the paternal Imperial bloodline, which is why some conservative scholars argue that the women's reigns were temporary and that male-only succession tradition must be maintained. After many centuries, female reigns came to be officially prohibited only when the Imperial Household Law was issued in 1889 alongside the new Meiji Constitution. In ancient Japan, most of the empress consorts were princesses, except for Iwa-no hime (empress consort of Nimmyō). After Kōmyō Kōgō (empress consort of Shōmu), daughters of Fujiwara clan or other clans could become empresses consort. Originally Chūgū (中宮) meant the palace for Kōgō, Kōtaigō (皇太后) (Empress Mother/Empress Dowager), or Tai-Kōtaigō (太皇太后) (Grand Empress Mother/Grand Empress Dowager). Until mid-Heian Period, Emperor had only one empress consort, and empress consort was also called Chūgū. Since Emperor Ichijō, because some Emperors had two empresses Consort, one of them was called Kōgō and another one was called Chūgū. After maiden Princess Yasuko became Kōgō as the mother-in-law (准母) of Emperor Horikawa, maiden princesses also became Kōgō. Kōgō is the title of a non-reigning empress consort. The title, still in use, is generally conferred on an emperor's wife who had given birth to the heir to the throne. The title was first awarded posthumously in 806 to the late mother of Emperor Heizei. Chūgū was a term which evolved during the Heian period; and it came to be understood as the title of the empress. For a time, chūgū replaced kōgō; and then the titles became interchangeable. The numbers of kōgō varied, but there was only one Chūgū at a time. The title kōtaigō was given to the wife of an ex-emperor; and the title tai-kōtaigō came to be used by a dowager empress. ↑ Nussbaum, Louis-Frédéric. (2005). "Kōgō" in Japan Encyclopedia, p. 543, p. 543, at Google Books. 1 2 Ponsonby-Fane, Richard. (1959). The Imperial Family, p. 318. 1 2 Nussbaum, "Chūgū" at p. 127, p. 127, at Google Books. ↑ Jochi Daigaku. (1989). Monumenta Nipponica, Vol. 44, p. 455. ↑ Ponsonby-Fane, Richard. (1915). The Imperial Family of Japan, p. x. This is a list of Japanese imperial consorts since Emperor Sushun's reign.